Some think that historiography is a science more or less like ballistics; that the careful plotting of where a phenomenon has been enables you to predict where it is going. If only the world were thus! The future, as history shows us, is essentially impervious to investigation. Sure, every once in a while somebody smart or lucky manages to plot a through-line, like when Isaac Asimov said in 1988 that one day we would have “computer outlets in every home, each of them hooked up to enormous libraries, where you can … look up something you’re interested in knowing, however silly it might seem to someone else.” But that happens so rarely as to make individual attempts at prediction as reliable as trickle-down economics. Still, it’s fun to try. In fifty years, Southern drinking will be very different from drinking in the rest of the United (or, by then, Disunited) States. Twenty-first-century drinkers have shown disdain for the centralization and homogenization that dominated twentieth-century tippling. They have embraced the small-scale and the localized. By 2066, that will have given us a South where new-wave agrarianism, rooted in the eighteenth- and nineteenth-century idea of the region as an agricultural paradise where you can grow the best of everything, coupled with the craft movement and its self-consciously traditionalist ways, will have kicked up a whole range of new-old drinks. There will be local wines, made from cleverly hybridized grape varietals whose DNA is largely American. And beer, of course, made in every county that allows it and often flavored with items from the Southern larder. Cowpea-chicory stout, anyone? No doubt Southern soft drinks will extend their recombinant ways in new directions—for all I know, the drink of the South in 2066 will be an electric-blue, chili-mango soda sweetened with local cane sugar (I’ll get to that) and factory-spiked with legal, synthetic THC. It was all about spirits, and if there’s one thing current trends tell us, it’s that hooch is back to stay. 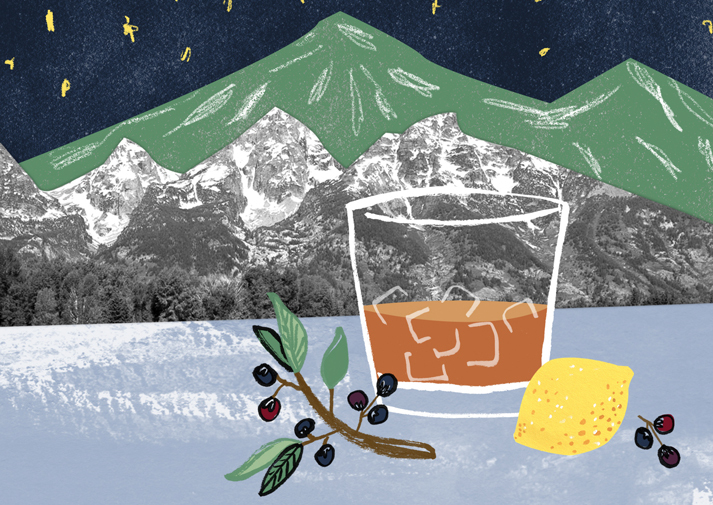 David Wondrich tells tale of the hot toddy’s history. A look at American distilling manuals from the early days of the republic, before whiskey chased off all its competitors, reveals a startling range of crops that were once distilled in the region, all ripe for reviving. 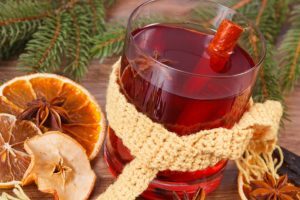 Some were terrible: Persimmon brandy was notoriously vile. Some were indifferent: Cornstalk rum, distilled from the juice that wells up in the stalks before they put forth ears, was generally thought to be passable if it was made properly (although it usually wasn’t). Some were good: paw-paw brandy, apple brandy, and whiskeys made from various grains. Even Lowcountry rice produced a decent liquor. One spirit was considered so excellent that it cost more than the finest imported Cognac: peach brandy from the Carolinas and Georgia, distilled from fresh peaches and their crushed pits and aged for many years in oak. 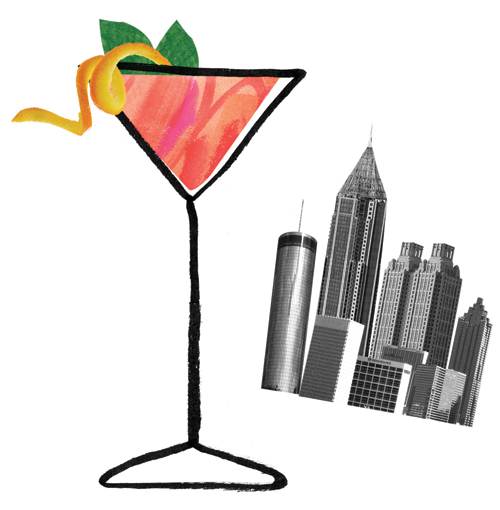 In the near(er) future: The Southern Foodways Alliance Guide to Cocktails will publish later this year. Fifty years from now, somewhere in the South, these spirits and drinks will be crafted, sold, and shaken or stirred into cocktails, flips, punches, coolers, and what-have-you. We’re already well on the way with many of them, as, say, a julep made with Copper & Kings brandy from Louisville will readily demonstrate. As a sort of experiment, here are four reconstructions—or rather, I suppose, preconstructions—of Southern drinks, vintage 2066. I’m assuming humanity is going to prove too pigheaded and dysfunctional to reverse climate change. Some parts of the South, hot and wet already, are going to get a whole lot hotter and wetter. There will be bugs. If we’re lucky, there will also be more sugarcane. Mixed with a little lime juice and a lot of ice, fresh cane juice is lightly sweet, grassy, and refreshing. 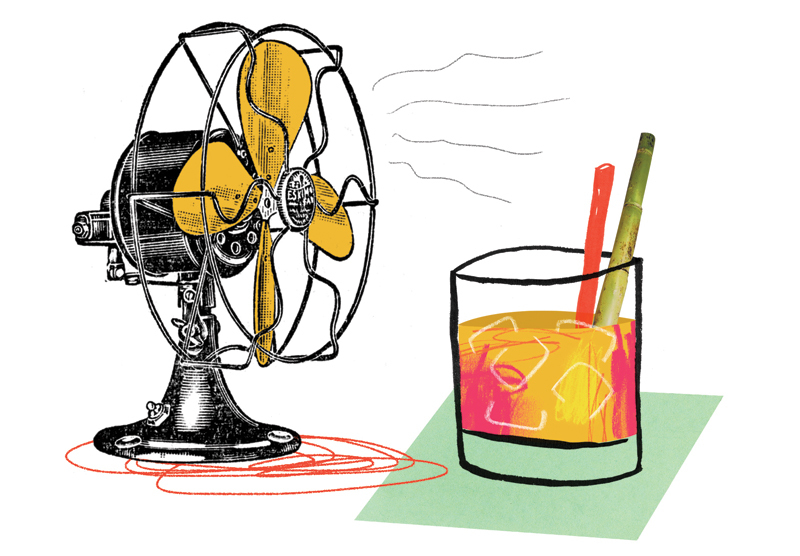 It’s easy to imagine little electric cane-presses popping up on lunch counters throughout the South; places where they’ll mix the juice with tea and ice and whatever else you want. Maybe even a healthy tot of local rum or, even better, an aged corn whiskey. 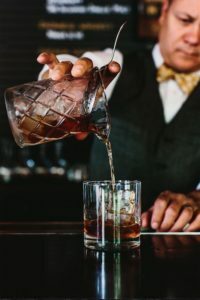 Always a Deep South staple, corn whiskey—unlike its close cousin bourbon, which goes into new oak barrels—ages in previously used barrels, from which most of the sharp tannins have already been extracted. The result is a softer-tasting, grainier spirit that won’t overwhelm subtle cane juice. Dash some bitters on top (assuming the current trend valorizing bitter flavors continues) and you have a drink that’s refreshing, spicy, and just plain delicious. Dash the top liberally with Angostura bitters, artisanal chokecherry-chinchona bitters, or whatever other bitters you prefer. Stir. Straw. 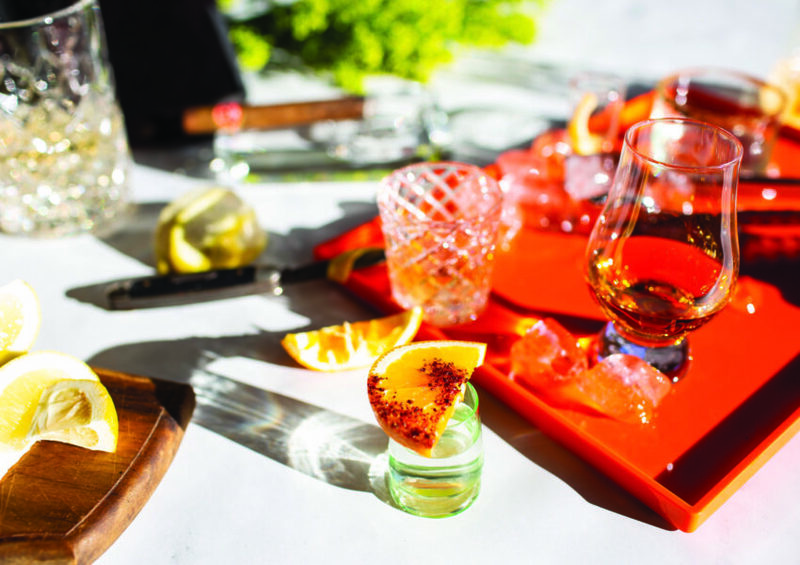 Bonus: Jerry Slater’s “Love Letter to the Old Fashioned.” Photo by Andrew Thomas Lee. The South already grows a good deal of sorghum, a hot-climate grain that is mostly used for animal feed or—when the stalks are cut before the grain develops and then squeezed—as a source for a particularly pungent sort of syrup. Like all grains, sorghum seeds are full of starch, which can be converted to sugar, fermented, and distilled. Now, until recently, we didn’t really do that with sorghum in America, other than for ethanol. Microdistillers such as South Carolina’s High Wire have begun turning the stuff into a slightly wooly sort of whiskey, but that’s just scratching the surface of sorghum spirits. The country that goes deep into beverage sorghum is China, where the resulting spirit is called baijiu, or “white wine.” It bears approximately the same relation to sauvignon blanc that a saber-toothed tiger does to an elderly, declawed lap-kitty. Funky—and that’s an understatement—fruity, dry, and very strong, baijiu is the blue cheese of the spirits world (indeed, much of that funk comes from a fungus, aspergillus, which Asian distillers traditionally use to start fermentation). Is baijiu going to be the tequila of the mid-twenty-first century? It doesn’t seem that way. But in 1950, Americans were still deeply suspicious of tequila, and just look at us now. 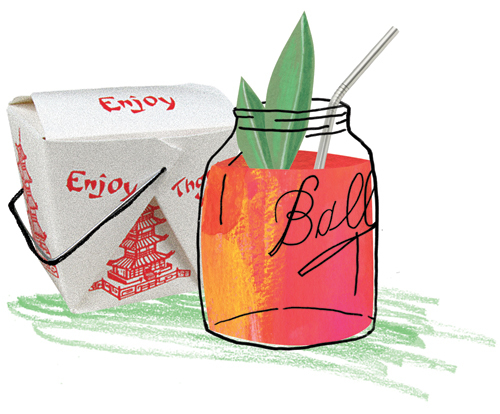 As the foodways that Asian immigrants bring to the U.S. South interweave with local traditions, it’s not much of a leap to imagine East Asian spirits influencing Southern drinkways. My example is a variant on the nineteenth-century Mississippi Punch, renamed with a nod to the Chinese immigrants who opened groceries in the Delta at the turn of the last century. It’s not for the faint of heart, but there’s a deep, swampy tang to it that captures the essence of the region. Strain into ice-filled pint mason jar and garnish with—hell, I dunno. I don’t even know what the cool kids are garnishing things with now, let alone fifty years from now. You’ll need a straw. *For this drink, you don’t want baijiu at its most intense. Kweichow Moutai, the flagship brand, would move into this drink, take over, and kick every other ingredient out on the street. Kaoliang, from Taiwan, still has plenty of the funk, but it can play with others. In 1854, the New York wine merchant and drinks authority Frederick S. Cozzens wrote in his newsletter, Cozzens’ Wine Press, that “the young rice of our South would make a very fine Arrack, beyond doubt,” and that “American Arrack might be made to rival that of Batavia.” A bit of explanation: Cozzens’s “Arrack” is the English version of an Arabic word, used throughout the Middle East and southern Asia, that means “liquor,” and is just as specific. There are many arracks, made from everything from palm sap to mare’s milk, and yes, even rice. Cozzens was right: You can distill something delicious out of rice. He’s also right that such a spirit “needs to be kept many years…before it is mellow enough for use.” As proof, we now have Kikori, a Japanese rice “whiskey” that is a blend of three- to ten-year-old pure-rice shochu. Light, nutty, and mellow, this quasi-whiskey with a hint of Asian fungal fermentation makes a good argument that Southern distillers should get into rice. 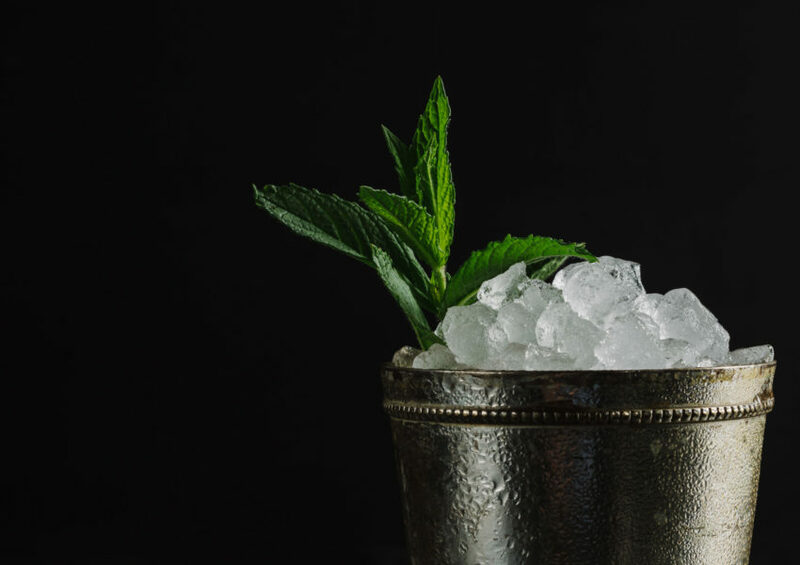 Assuming they do, and assuming that regional tradition inspires people to drink juleps, it’s easy to imagine the bartenders at Husk in Charleston in 2066 (I’m sure it will still be around) mixing fine Carolina Gold–whiskey juleps for their happy patrons. And, it being Charleston, a city once extraordinarily devoted to drinking Madeira, they’ll no doubt float some of the wine on top. By then, they might use a Southern-made equivalent. Stir 2 teaspoons sugar and 2 teaspoons water together in a tall glass. Add 5-6 fresh mint leaves and press lightly with a muddler. Pack glass to top with finely-cracked ice (the best way to get this is to put it in a canvas sack and murder it with a big mallet). Add 3 ounces Kikori rice whiskey. Carefully pour 3/4 ounce fine, rich Madeira or sweet Marsala on top. Slide in 3 or 4 mint sprigs and a couple of straws. 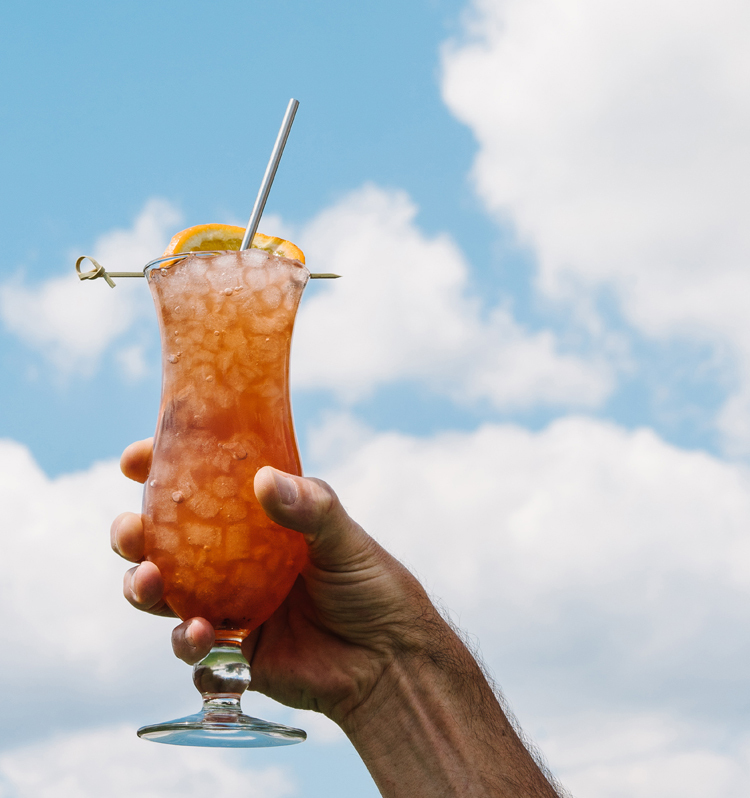 The Resurrexit is a liquid tribute to Atlanta, the Big Peach. “Resurgens,” the city’s motto, is Latin for “rising again,” as a Phoenix rises from the flames. By 2066, I predict we can nail that participle down into a past perfect: “It has risen again.” Resurrexit. The drink is a twist on a 1920s French one, the Burnt Fuselage (flames, what what). Lacking old peach brandy, I’ve used young peach brandy mixed with well-aged Cognac to add the old-brandy notes. The result is as suave and sophisticated as you please, but with a little extra warmth and generosity. 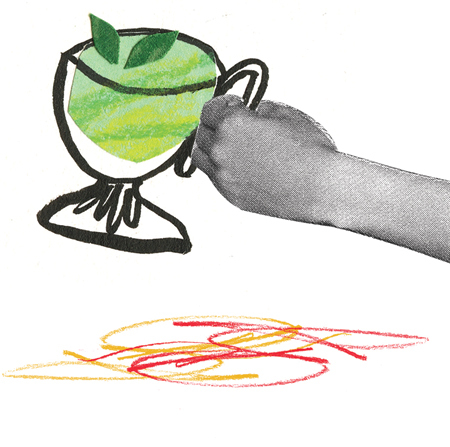 Strain into a chilled cocktail glass that has had its inside and its rim wiped with a mint leaf. Flame an orange peel over the drink. David Wondrich is the James Beard Award–winning author of Imbibe and Punch and the senior drinks columnist at the Daily Beast.